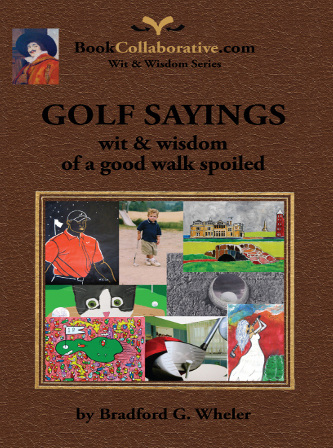 “GOLF SAYINGS: wit & wisdom of a good walk spoiled” by Brad G. Wheler is an exciting and vibrant collection of golf art and text designed to celebrate golf and the people that love the game". ​This golf art book showcases artwork along with quotations about golf that covers topics including sportsmanship, golf humor, the pros, Scotland, and even presidential golf. This collaborative publication has two goals in mind: first, to honor and highlight the great game of golf though text and artwork, and secondly, to showcase the talents of new & emerging artists who focus on creating golf art. BookCollaborative.com provides artists with a platform through which they can gain exposure and recognition. Artists were invited to submit their work to be a part of this golf art book. The end result includes 36 artists from countries including the US, UK, Canada, Dominican Republic, Germany, Switzerland, and Sweden. GOLF SAYINGS features a variety of golf art styles including golf photography, illustrations, collages, and paintings. Among selected artists whose works are featured in “GOLF SAYINGS” are LESLEY GILES an artist from England who has “walked inside the ropes” with top golfers including Tiger Woods.